From humble beginnings, Carole King fought her way into the record industry and, as a teenager, sold her first hit, Will You Love Me Tomorrow, when she was just 17. By the time she was 20 she was writing number one hits for the biggest acts in rock ‘n’ roll, including The Drifters, Aretha Franklin and The Monkees. But her greatest challenge was to find her own voice and finally step into the spotlight. The Oliver Award winning show begins with Carole King’s teenage years as she fights with her mother, her meeting with future husband and song-writing partner Gerry Goffin, their close friendship and playful rivalry with fellow song-writing duo Barry Mann and Cynthia Weil and her remarkable rise to stardom with her self-penned solo album Tapestry. The multi award-winning musical features classics including So Far Away, It Might As Well Rain Until September, Take Good Care Of My Baby, Will You Love Me Tomorrow, Up On The Roof, Locomotion, One Fine Day, You’ve Got A Friend, (You Make Me Feel Like) A Natural Woman and I Feel the Earth Move. Hotels nearby include the 5 star Savoy, the 4 star deluxe Guoman Charing Cross and the 4 star Strand Palace – all situated a short walk away on The Strand. Other worthwhile hotels within easy reach are the impressive 4 star deluxe Kingsway Hall, the 3 star Thistle Trafalgar and the 5 star Radisson Edwardian Blu Hampshire in Leicester Square. So lots of choice on the doorstep. If you would rather stay elsewhere in town then it is very easy to get to the theatre by tube: Covent Garden, Holborn and Charing Cross underground stations are all within 5-10 minutes walk giving quick access to north and south London plus Kensington and Knightsbridge areas to the West. Plus a whole host of buses pass right outside the theatre door coming from all over London. I booked for my sisters 60th birthday and both her and her husband had an amazing stay at the hotel and thoroughly enjoyed the show. The hotel was beautifully positioned and they highly recommend it for a stay in central London. The staff and facilities were great. Breakfast was particularly nice. Thank you so much for your review and I am so glad your sister enjoyed the show and their stay at the President: what a lovely birthday present! This was not my choice but was my husbands turn to choose but I am so glad he did it was absolutely fantastic. 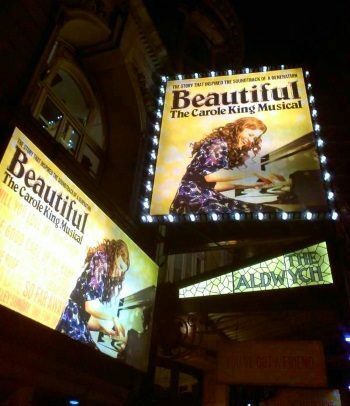 I liked Carole King as a young woman but really Tamla was my passion so I really did not expect to love this show soooo much but it was fantastic from start to fabulous finish. I have been recommending it to all my friends of all age groups. We had a great theatre weekend overall and we are already planning another. A beautifully crafted show with hit song after hit song - there was not a single one I hadn't heard of and hearing each one brough back a different memory form my childhood. The script was extremely witty and flowed majestically around the songs. What a show! Well derserved standing ovation at the end.